One of my favorite conferences of the year is the Bridge Conference. In 2006, the AFP DC and DMAW joined forces to build the bridge between traditional fundraisers and their direct marketing counterparts. More than 2,000 people joined together last week to share ideas, learn from successes [and failures], and catch up on life. Hats off to the 2018 Bridge Leadership Team for an incredible conference. The fundraising and marketing community appreciate all of your hard work. 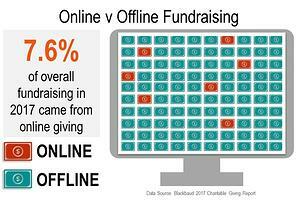 I had the privilege of moderating Fundraising STATs: Just the Facts on Fundraising Statistics. During this session, Ben Miller discussed industry trends from the Fundraising Effective Project and Jonathan Benton, from M+R Strategic Services, provided much-needed insight into online giving and usage trends. Ben and Jonathan's presentation was impressive. I was most impressed and inspired by the audience engagement, insight, and swift observations. Thank you to all that attended. For those that couldn't make it, visit FundraisingStats.com to download the metrics discussed. If you're looking to compare your numbers against these stats, start here. Donor retention has been less than 50% for more than a decade. Decline in retention signal problems ahead. High dollar donors are increasing in value. Mid-level and Major donors are increasingly more important to organizations. New donors account for more than 40% of an active file. Revenue from one-time gifts increased by 19%, while monthly giving revenue increased by 40%. Nonprofits received $42 for every 1,000 fundraising emails sent. What stats and benchmarks do you need to know? We want to hear from you so we can make FundraisingStats.com the best resource for fundraising trends across the industry.